When a new variety of Huggies nappies start filling shelves in supermarkets this month, most shoppers will have no idea about the impressive innovation and collaboration efforts behind them. Nappies, despite being a consumer category in Australia worth about half a billion dollars a year, tend not to arouse a lot of excitement or curiosity. 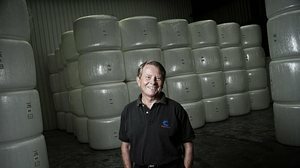 The new Huggies will be unique in their use of a fabric technology dubbed 3D UltraAbsorb, the result of a three-way collaboration between multi-national personal care giant Kimberly-Clark, the CSIRO and family-owned textile manufacturer Textor. “I think the success of this particular innovation boils down entirely to the trust between the three organisations,” explained Textor’s managing director Phillip Butler to Manufacturers’ Monthly. The matter of trust was helped along by Textor’s long association with the American corporation, which appreciated Textor’s fabrics enough to name the company their global supplier of the year in 2011. The CSIRO also has a lengthy association with Tullamarine-based Textor, who were one of the first companies to have a Commonwealth scientist embedded in their operations as part of the Researchers In Business (RIB) program. “We were fortunate in that we got an exceptional senior research scientist to come and work with us for a year,” remembered Butler, whose company has worked with physicist Dr Niall Finn, on and off, for three years. The CSIRO’s group executive for manufacturing, materials and minerals, Dr Calum Drummond, said that trust was something that his organisation worked hard to inspire through its work in programs such as RIB. “Essentially we assist in making their businesses more competitive and sustainable,” he told Manufacturers’ Monthly. “So for us it’s very much about them rather than us, because we don’t make any products or processes. What we provide is a service for others that produce products, processes and other services. “And when you come from that approach – that it’s all about others, rather than about yourself – that’s a good level from where to build trust.” Butler pointed out that having a talented researcher contribute to the company was an exchange, with each party influencing the other along the way. He added that – though learning from the attempt was always inevitable – with innovation, there’s no guarantee of success. The Textor boss suggested that Australian industry needed to do much more to link up with researchers. As the small business representative on the prime minister’s manufacturing taskforce and a member of its National Precincts Board, it’s a topic that is dear to him. Various investigations, such Deloitte’s Global Manufacturing Index survey, released last November, support Butler’s contention that innovation assisted by professional researchers is vital for improving the country’s competitiveness in manufacturing. Research, believes Butler, can tend to be supply-driven, rather than what might be industrially useful. Besides the boost to Textor’s innovation muscle, the CSIRO also provided a pilot line at its Geelong facility for “de-risking” purposes. “Our own scientists and Kimberly-Clark Australia’s scientists and the CSIRO’s scientists all worked together on the prototype machines, modified them, changed the designs, changed the line layout, until the concept was proven,” remembered Butler. Innovation has been listed as one of the reasons for Textor’s success in textile manufacturing, a segment of manufacturing that has declined noticeably in Australia due to the absence of tariff protection and the punishing exchange rates. “With the currency where it is, at parity, and it’s probably going to stay at parity for a long time, the math says that any manufacturing business can’t survive if it was successful at 80 cents in the dollar,” mentioned Butler. He pointed out that a strong Australian dollar can have its upsides too, or at least it can for a business like his, which exports to four Asian countries, and relies on expensive equipment at its high-tech factory.